Frequently asked questions and answers about membership and becoming a member. Q: How can I contact The Marine Mammal Center about membership? A: Please choose the method that's most convenient for you. Q: Is The Marine Mammal Center a 501(c)(3) certified organization? A: Yes. Our Federal Employee Identification Number (FEIN) is 51-0144434. Q: How much are membership dues, and are they tax-deductible? A: Basic Membership starts at just $25 for one calendar year. You can join online or call or email the Membership Team. Your annual membership contribution is tax-deductible to the extent allowed by law. Visit Become a Member for more information. Q: What benefits will I receive as a member of the Center? A membership card entitling you to 10% discounts at our Marin Headlands and online gift stores. An online newsletter with the latest patient and Center news, including in-depth articles about our research around the globe. Family Members and "Giving Circle" members are entitled to additional special benefits in recognition of their exceptional commitment. See Compare Memberships on our "Become a Member" page to view all current member benefits. A: You may renew your membership online, by mail, or by phone (as per contacts above). The first membership renewal is mailed each year in August and includes a reply envelope for your convenience. You may also choose to become part of our monthly donor program, which includes membership (see below). A: It's easy! Read more about becoming a monthly donor. Q: How can I find out more about the Center? Explore other areas of our website, such as Education, Volunteer, and Research. Visit our hospital in Sausalito, California! Click here for more information. Q: How can I increase my support? A: There are a number of ways. 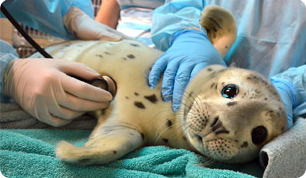 Give a gift of membership, a memorial or tribute gift, or send an Adopt-a-Seal® to a loved one! Check with your Human Resources Department at your workplace to see if they have a Matching Gift program or Workplace Giving campaign. Join our Steller Legacy Circle by including The Marine Mammal Center in your estate plans. Respond to a Special Appeal, mailed to you throughout the year. Tell your friends and family about the Center. Q: Do you exchange your membership list with other organizations? A: Yes, we do exchange our list with other like-minded organizations, but we're happy to honor your request not to do so. Simply let us know by calling (415) 289 -7335, e-mailing members@tmmc.org or sending us a note at the address above. Please make sure to include your full name and complete address. Please note: your email address and phone number are never shared. Q: How do I prevent duplicate mailings? A: If you are receiving duplicate mailings, please let us know and we'll correct our records - and in the meantime, consider giving the extra mailing to a friend. Please let us know the exact name and address each mailing is addressed to, and which one you prefer to keep. Q: Do you have a comment or suggestion box for members? A: Yes, just send your ideas, positive feedback and constructive criticism to members@tmmc.org.